When I make asparagus, nine times out of ten, I roast it. Steamed asparagus is good and sautéed asparagus is better, but neither compare to roasted asparagus. Just like with cauliflower, roasting mellows the flavor of asparagus. It gets caramelized and tender and just perfect in every way. 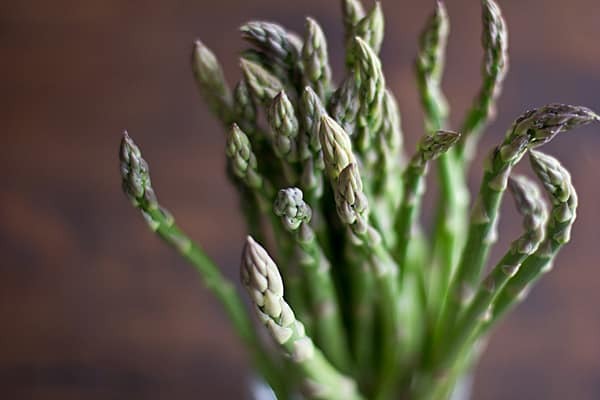 As soon as I saw spring asparagus at the grocery store, I knew I had to buy it, but other than roasting it, I wasn’t sure what to do with it. I played around with different ideas and settled on a sandwich. Roasted asparagus sandwich! You never see asparagus on a sandwich, right?! But then the more I thought about it, I realized there’s probably a reason for that–asparagus would be a little bit unwieldy on a sandwich. So I decided to make an asparagus pesto to spread onto the sandwich and I topped that with roasted shiitake mushrooms and Fontina cheese. Believe it or not, I grilled this on my Griddler, but I can never get nice grill marks on my panini, no matter how long I let it sit on there. Well, the inside still got nice and melty, which is more important than the aesthetics, I think. Served with a light spring salad, this Shiitake Panini with Roasted Asparagus Pesto is a great way to say hello to asparagus season. 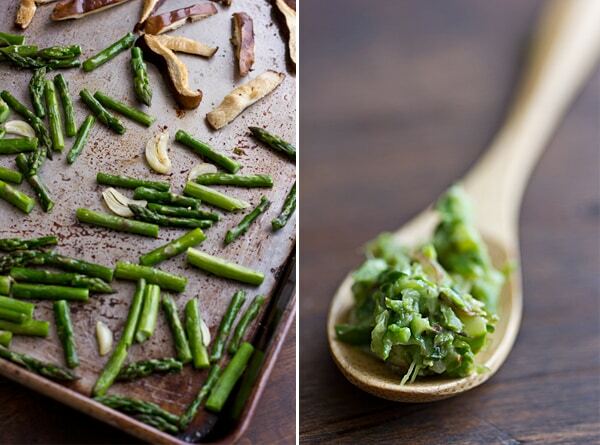 Hello, asparagus season! I will enjoy the heck out of you! 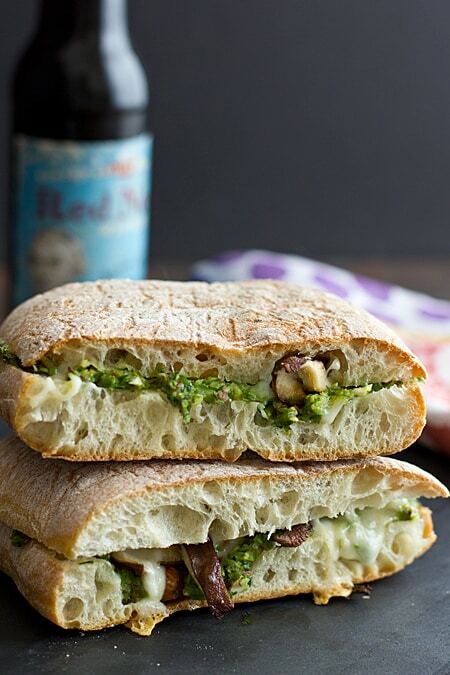 A rustic panini made with shiitake mushrooms, Fontina cheese, and roasted asparagus pesto. I’m so hungry right now and that sandwich not only sounds, but looks amazing. I can imagine biting into a sandwich stuffed with whole asparagus spears wouldn’t make for very attractive eating! This pesto sounds like the perfect solution – sounds so fresh and springy, and I like how you paired it with mushrooms and fontina. I can’t wait to see local asparagus here! Wow! Asparagus pesto!? What a GREAT idea. Sounds delicious – especially on a sandwich! You certainly outdid yourself with this one! So very creative and it looks beyond delicious! It’s asparagus season now so I have to give this a try. Your pictures are beautiful but I especially love the one of the asparagus bunch. Thanks for sharing this! This delicious! A great way to use asparagus that will hopefully be going on sale soon! 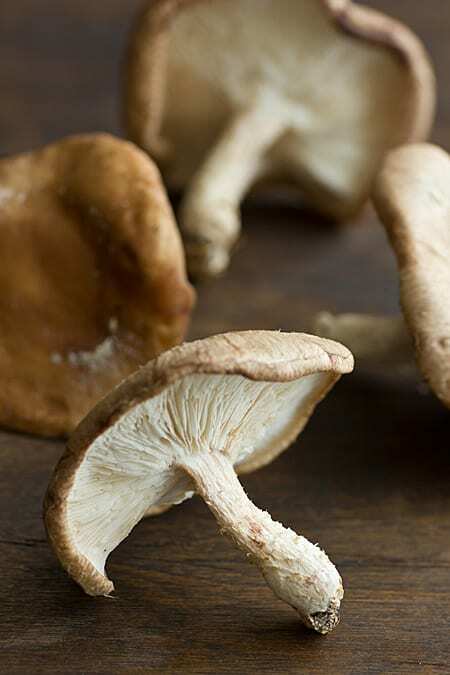 your photo of the mushroom is so pretty…i love that the mushroom really looks pretty…i’ve alredy pinned this recipe can’t wait to make when asparagus is fresh by us….this is my kind of sandwich! Only one word for this….BRILLIANT!!! This looks like a great idea for asparagus. I bet it would be great on pasta too. I’m totally going to try this soon! I definitely want to try it on pasta too!